Peter Lovesey holds a Crime Writers Association Diamond Dagger for lifetime achievement in the crime-writing world, among many other literary accolades. He is also 2018 Grand Master of the Mystery Writers of America. It’s not surprising therefore that his latest novel, Beau Death, published in hardback last year and now available as a paperback, is a first class winner. 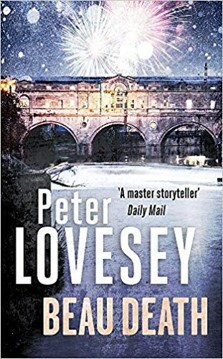 Set in Bath with the inimitable Detective Superintendent Peter Diamond at the helm of his seventeenth case; Beau Death is a treat both for his many fans and for newcomers to the series. A father and son are watching a wrecking ball in action at a construction site. The ball is all too effective as it smashes the top floor wall of an end of terrace house revealing its interior. There they can see what remains of an old man clad in eighteenth-century costume and sitting in a chair. Not a usual archaeological find on a building site. Could this old gentleman possibly be Beau Nash, Bath’s most famous eighteenth-century resident, with his burial place been the subject of dispute? He was thought to have been buried in a pauper’s grave, whereabouts unknown, but now there might be another explanation. Peter Diamond sets out on the trail to track down the truth, but this cold case leads him into very hot water, both with his colleagues and with those who zealously guard Beau Nash’s reputation. As usual with Peter Lovesey’s novels; whether they dive into history or squirrel themselves into modern dramas, the plot of Beau Death has twists and turns that the reader doesn’t see coming. Historical Bath meets modern Bath as the plot glides seamlessly between the two. Each time I flattered myself that I could see what lay ahead - the author delivered one of his own masterly wrecking balls that left me gasping. I should have known better. The only thing you can be sure of with a Lovesey novel is that you will have an unforgettably satisfying read.